I moved into this property a year ago and the electrician who came out recently to fix a hot water issue wanted to replace this but the landlords wouldn't. My tenancy is through the council but it's owned by a private company a bit like a housing association. Ive also just got a £600 electric bill for a 3 month period and believe this may be responsible. I still think it should have been replaced. Apparently the place was electrically tested before I moved in but I don't believe that because the washing machine plug socket didn't work when I moved in and they had to install a plug under the sink recently so I could use it. I think you will probably have to start off by getting your own independent electrical inspection done. If it fails, then I would say that you would be entitled to get the costs of it from your landlord. No doubt there will be trouble about that so come back here. Thank you can I request the council do that or do I have to pay myself and sort it all out myself? The cost will be an issue because I can't work for health reasons and I am on benefits. I'm afraid that I don't know the answer to that problem but I am certain that you will be best off getting a completely independent electrical safety inspection and that means from somebody who works for you – and that means that you will have to pay for it. 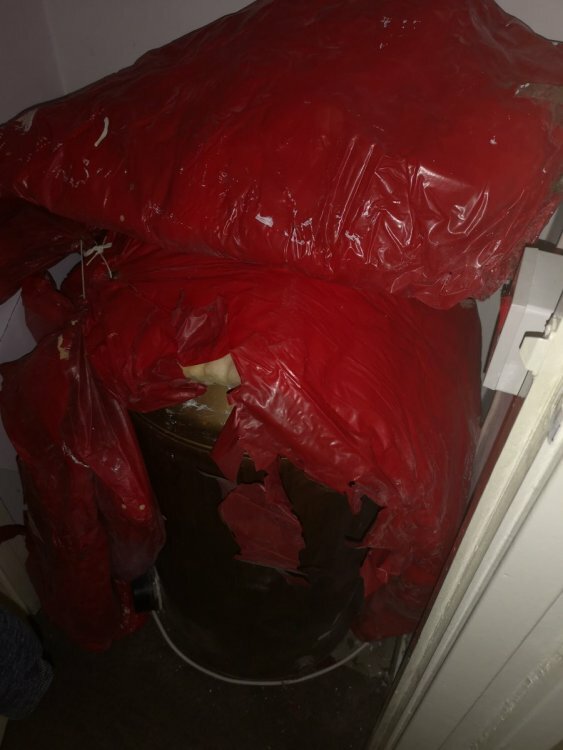 I suppose if you wanted to get the council involved then you might want to make a complaint that your home does not comply with various regulations. In that case, maybe you should look very carefully at all the regulations in relation to certification, smoke alarms – et cetera et cetera and see whether there is anything in your home which doesn't comply. That might give you the basis upon which to make a complaint. However it is probably all very time-consuming and quite unsatisfactory. there no mains feed to that so it CANT be the source of your high bills!! the mains feed has been removed!! immersions last at best 5yrs from that era. So it’s that old? I thought it was, so it’s still legal? And you say mains feed? It does have a mains. 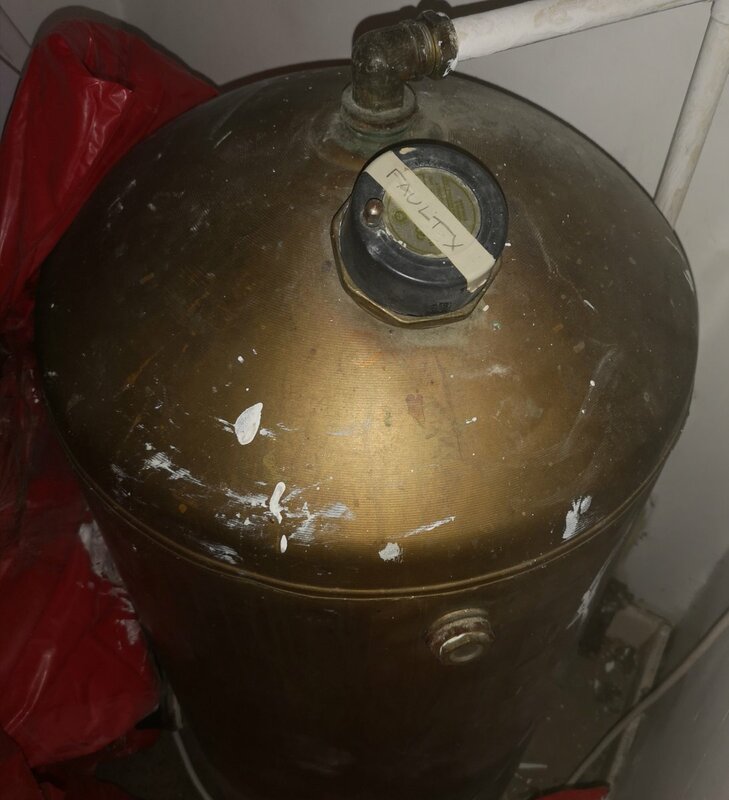 Also the mains for this immersion heater kept tripping my electric a couple of months ago and it totally burnt out in the end and didn’t trip my electric and could have caused issues. The socket and wire had to be replaced and I was without hot water for 4 days because of their very poor response and as a disabled person it caused a lot of issues. there should be that white wire feeding into the whole at the side. You’re very wrong, the fuse and socket burnt out, the electrician came round and changed the socket and wire and put a new fuse in. i turn it on and off for hot water everyday. ok well don't show photos that don't show that then eh? 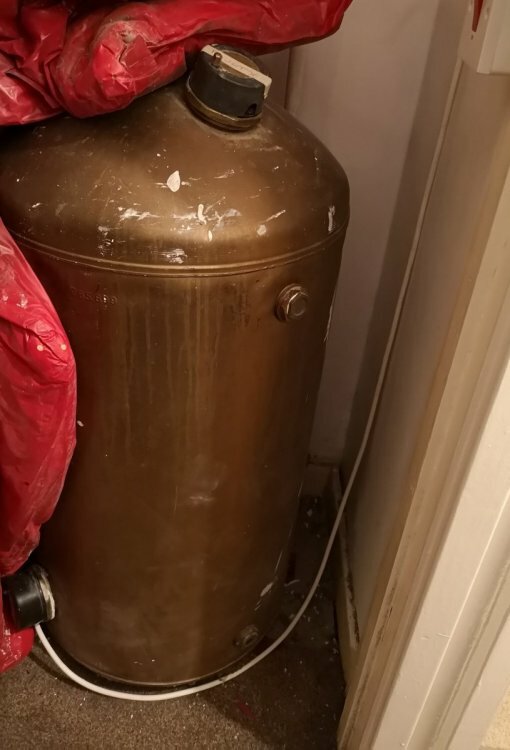 The electrician wanted the whole immersion tank replaced there and then but my landlord who is a private company similar to a housing association refused. This property was provided to me by the council as I was homeless and it’s managed by a letting agency, they are useless to. I will try try and get a better photo sorry. aha see theres one down the bottom..
and we can see the new switch too..
the old one going south could well have caused high electric use yes. is could be full of fur and limescale, but I doubt they'd have bothered to fit the bottom element if it was that bad. the only issue with bottom heating is it uses far more electric to heat the water than the old top feed down element. sadly what they have done is quite acceptable. and is the water much hotter or colder than how things used to be. 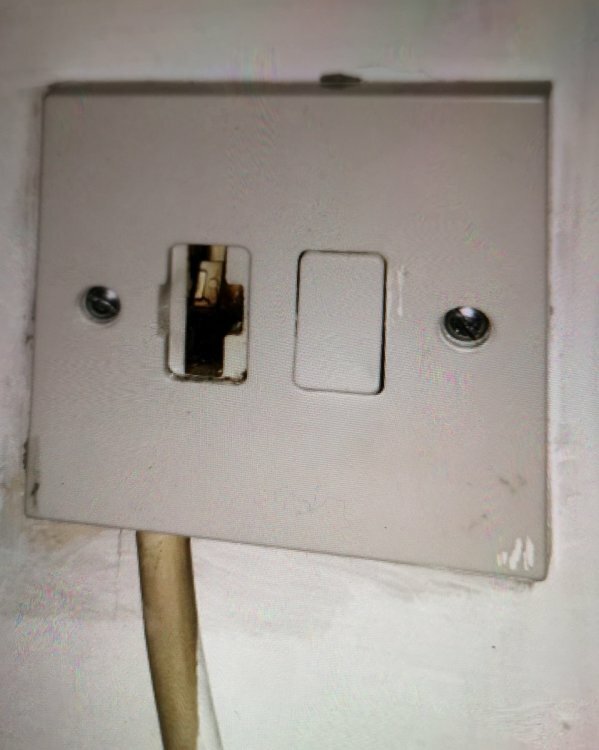 When I moved in last year the top one was labelled faulty, it’s always been running from the bottom from start of tenancy, they just replaced the socket and wire so nothing is different but the high electric issue is a big concern considering I live alone in a small flat. The big bill is between December and March, the socket and wire on the immersion heater was replaced around 20th February. good further info all becoming clearer now when we get the right answers from the right questions. so the bottom immersion was fed from the old top mains feed but that got replaced by the new outlet in feb after it went faulty. I wouldn't think the old wiring caused your high bill no. Suggest that complain to the council, as you mention that the council arranged the housing and therefore are required to check the standard of accommodation offered by the housing association they outsourced the provision of housing to. I would not be happy with any immersion heater provision of hot water, as that is a really expensive way to heat water. During the winter with colder water, it can take a couple of hours to heat a tank that size. So if you had the heater on for say 4 hours per day, over 3 months, that would be quite expensive. Then add on other electricity usage and I could see that getting close to £600 for 3 months. The council housing department should take an interest, but if they don't then contact your local councillor. an immersion heater element at the botton is more efficient than the old ones that were in the top anyway. Will it pass an electrical test? possibly but that will depend on how old the rest of your household electrical circuits are as the regulations that were in place when they were installed are the ones that apply, not the current ones unless some substantial work has been done. Could this rewire be considerd substantial? Surface mounted electrics generally arent enough to make the whole thing comply to the modern regs so you will then have to get a test done to see if there is an earth leakage somewhere or a socket is incorrectly wired. what about your portable appliances? they should be tested as some old stuff may cause problems.